Please toggle to view the brochures and articles online. Spencer ARL Plant Manager John Vernette talks about the honor of the firm being named North Country Chamber of Commerce’s Business of the Year. PLATTSBURGH — Five winners really earned their place at the show when the North Country Chamber of Commerce celebrated its 2014 awards dinner. The theme of Friday night's event was "And They're Off," with guests invited to dress in Kentucky Derby-themed garb, and the multiple honorees made it a great night for a photo finish. SpencerARL was named the 2014 Business of the Year. 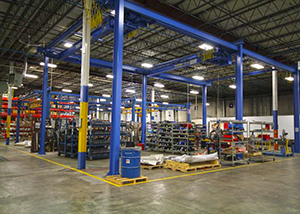 The company specializes in logistics services for the mass-transit industry, including sub-assembly work for both Nova Bus and Prevost in Plattsburgh. "We were pretty surprised, obviously," said Plant Manager John Vermette. "The group here was pleased. It shows their effort and collaboration didn't go unnoticed." He said he was surprised at the recognition from the chamber when there are larger operations in the area, such as Bombardier, Nova Bus and Prevost. 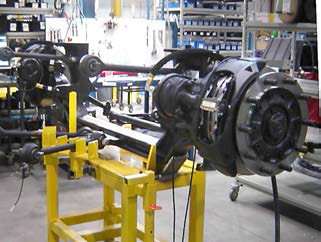 The company has a long history of support operations for the automotive industry through its operations in Windsor, Ontario. 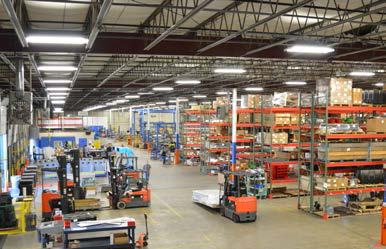 It was the Nova Bus plant, which opened on Banker Road in 2009, that led Spencer ARL to move into 40,000 square feet of space in Air Industrial Park. "Our first contract for this location was for Nova Bus," Vermette said. SpencerARL has grown every year, as the scope of Nova Bus's operations have increased. That continued last year with the addition of Nova's sister company, Prevost, at the Banker Road assembly plant. 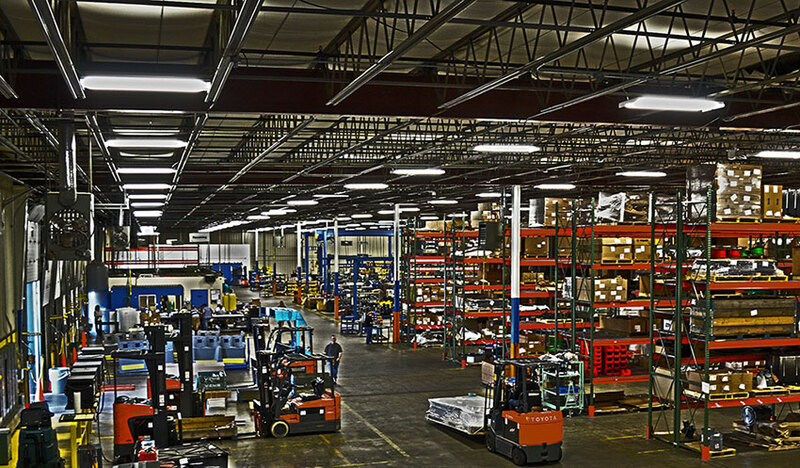 While they still occupy the original location, SpencerARL also expanded into an additional 80,000-square-foot space right next door in June. Vermette said they invested about $1 million to get the new facility up and running. They are still ramping up on the Prevost contract and expect to be helping that company produce one bus a day by March. Nova Bus plans to be assembling three buses a day by the end of this year and has orders in place that call for four units a day in 2016. "It appears the market is hungry for mass transit," Vermette said. 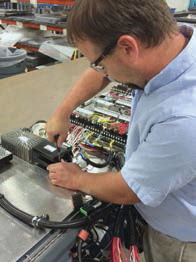 To help satisfy the need, SpencerARL employees perform 500 major sub-assemblies each day. 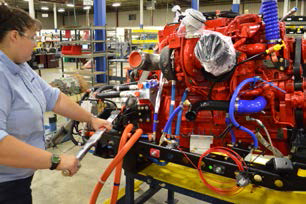 They put together complete systems — engines, nose caps, dashboards and more — that are then delivered to the bus plant for final assembly. "We build 26 percent of every bus," he said. They deliver eight to 10 fully loaded semi-trailers to Nova Bus each day, Vermette said. SpencerARL employees even work inside the Nova Bus plant to help ensure a smooth mesh between the two companies. Spencer ARL has about 130 employees at present and expects that number to increase by as many as 20 with some new contracts this year. Vermette said the chamber, Development Corp., Empire State Development, Clinton Community College and CV-TEC have been tremendous partners in training, either through funding or actual instruction. "They have been really fantastic," he said. 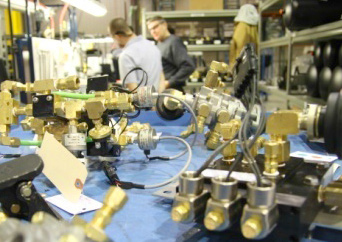 The company has been supportive of workforce-development initiatives, such as the P-TECH program underway at Peru Central School and the Advanced Manufacturing Institute planned for Clinton Community College. Vermette is taking part in the Mass-Transit Cluster initiative organized by the Development Corp., which seeks to bring all facets of the process together, from education to workforce development and employers. Governor Andrew M. Cuomo today announced that SpencerARL New York, Inc., a leader in the transportation assembly industry and a New York State certified woman-owned business, is expanding its operations in Plattsburgh. The company has signed a five year lease for an 80,000 square foot building in The Development Corporations Air Industrial Park in addition to continuing to operate out of its current facility nearby, with the combined square footage of 110,000 square feet. The expansion has already created 47 new jobs in the local community, and the company plans to hire additional people over the next year. By expanding their operations in Plattsburgh, SpencerARL has made an investment in the future of the North Country one that will create jobs and new opportunities, Governor Cuomo said. This is another example of how Upstate is on the move, and I am proud that we were able to step in and support the local economy. SpencerARL New York specializes in providing third-party logistics services to the transportation manufacturing industries. 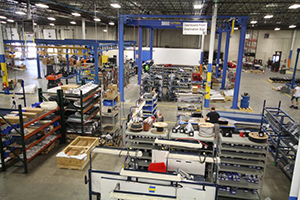 In 2009, SpencerARL New York opened its facility in Plattsburgh to supply these logistical services, sub-assembly and sequencing to Nova Bus, which had recently begun production at its assembly plant in TDCs Banker Road Industrial Park. Nova Bus is a leading world-class manufacturer of sustainable transit solutions in North America. Its portfolio includes electric-hybrid, natural gas and bus rapid transit vehicles. SpencerARL New Yorks move to Plattsburgh was a strategic decision by corporate management to use Plattsburgh as a base for continued expansion to other mass-transportation manufacturers in New York and the United States. SpencerARL New York has since signed a contract with Prevost Bus, the leading North American manufacturer of premium passenger coaches and conversion coaches for high-end motorhomes and specialty conversions. 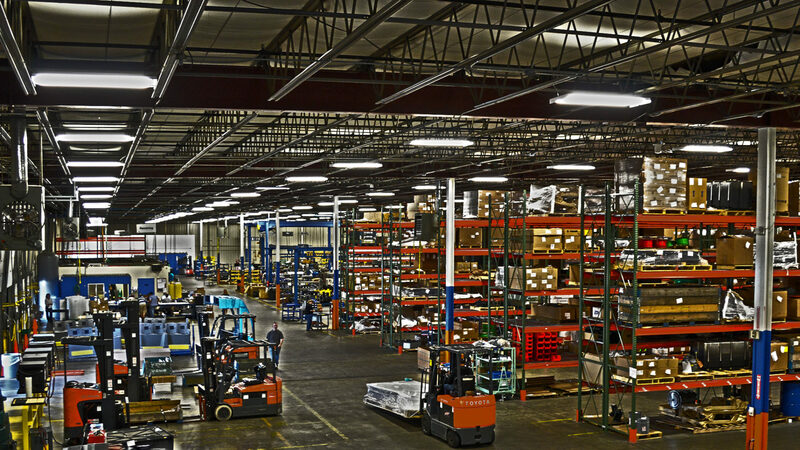 SpencerARL New Yorks commitment to provide logistics solutions to Nova Bus and Prevost has prompted the need for expansion of both its facility footprint and employment base. Spencer CEO Lori Fisher said, SpencerARL New York has worked with Empire State Development, TDC, the transit manufacturing industry and other local officials to bring new jobs to Plattsburgh and is excited about its continuing participation in the revitalization of the Plattsburgh area. We see our training program and the additional on-the-job training as key to our continued success in Plattsburgh. To support this expansion project, Empire State Development is providing SpencerARL with $300,000 in Excelsior Jobs Program performance based tax credits which are tied directly to job creation and investment commitments, and will allow the company to reinvest cost savings to make it more competitive when bidding on contracts. Empire State Development President, CEO & Commissioner Kenneth Adams said, By supporting SpencerARLs expansion, ESD is not only helping to create new jobs but also bringing new investment into the local community. The additional capacity will allow the company to better serve its customers and strengthen the thriving transportation equipment industry in the region. TDCs President and CEO, Paul Grasso said, We are delighted that TDC was again able to accommodate Spencers growing business model and meet their business specifications and timing. SpencerARL New Yorks success in the region confirms the International Economic Development Councils belief that on average 80 percent of job creation will come from existing companies in any given region. This is precisely why TDC developed and launched a business retention program for our Parks in 2012. As I have said before, at TDC we feel that our success is defined by the successful companies that are in our region - and clearly success breeds success. In addition, SpencerARL New York has submitted a Consolidated Funding Application to New York State Homes and Community Renewal to help with their training needs. The project was designated as a regional priority by the North Country Regional Economic Development Council. NCREDC Co-chair and President of the North Country Chamber of Commerce Garry Douglas said, SpencerARL is a great company and a valuable part of our transportation equipment cluster. They are unique in that their skills and expanded operations will not only support Nova Bus and Prevost but hold real possibilities for helping us to draw other contracts and product lines here. And they are good corporate citizens too, engaging in the chamber, the community and workforce development efforts. We thank them for their commitment to Plattsburgh and look forward to continuing to work with them for years to come. Thanks also to Governor Cuomo and the state for all of their assistance and support. NCREDC Co-chair and President of Clarkson University Tony Collins said, Through the NCREDC plan to create jobs and economic growth by focusing on regional strengths and assets, we have transformed the outlook for emerging clusters like the transportation equipment sector into growing realities with critical mass. The expansion at SpencerARL is a terrific example of how the North Country used Governor Cuomos new approach to economic development to build unprecedented cooperation among public and private organizations at state, regional and local levels. SpencerARL New York, Inc., is run by President and CEO Lori Fisher and is a New York State certified Woman Business Enterprise. Fisher oversees an executive management team that has extensive experience providing material management services to automotive Original Equipment Manufacturers including the Ford Motor Company and General Motors. Nebe Tamburro, a member of the SpencerARL New York management team, said, Our relationship with the TDC, the local Department of Labor, the North Country Chamber, the State of New York, especially Empire State Development and Homes and Community Renewal, is ultimately why we have been successful from day one in Plattsburgh. I will once again say that in all of my years building over 70 outsourced facilities in eight different countries that the Plattsburgh team is far and away the best. Congressman Bill Owens said, This is great news for Plattsburgh and the surrounding community, bringing good jobs and growing manufacturing in the region. SpencerARL's decision to expand this facility is a testament to the employees who have helped make the existing facility a success, showing once again that northern New York is a great place for businesses to grow and succeed. Senator Betty Little said, The growing transportation industry is continuing to move the Plattsburgh regions economy ahead. This expansion adds to that momentum. It really is wonderful to see SpencerARL New York, a New York State certified woman-owned business, thrive and create more jobs. Its also great to see a local company succeed in partnership with The Development Corporation, Empire State Development, the North Country Chamber and local officials. Assemblywoman Janet Duprey said, I am pleased with the large facility expansion and subsequent addition of new jobs at SpencerARL. As Plattsburgh continues to grow as a transportation hub, this expansion will assure the smooth and timely sub-assembly services to manufacturers such as Prevost and Nova Bus. Congratulations to The Development Corporation for the foresight in providing adequate space for this expansion, and thanks to Governor Cuomo and Empire State Development for their continued investment in the North Country. Town of Plattsburgh Supervisor Bernie Bassett said, SpencerARL New Yorks expansion is great news for Plattsburgh and a testament to our strategic location and skilled workforce. It is our hope that this project will ensure the companys competitiveness, allowing them to remain in the Town of Plattsburgh for the long-term. I thank Governor Cuomo for his support in growing the North Country economy. Clinton County Legislature Chair Sam Dyer said, This expansion project has already led to the creation of dozens of good jobs for Clinton County families with the promise of additional jobs in the future. We congratulate SpencerARL on this new venture and thank Governor Cuomo, New York State, TDC and all partners involved in making this project possible. SpencerARL New York, Inc. provides integrated logistics services to the transportation industries. 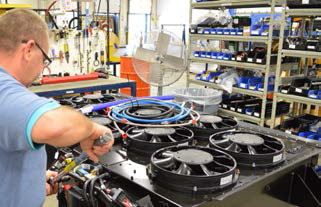 We handle, process, and manage the inbound and outbound flow of materials for transit bus manufacturers. Please click the icon to view the brochures and articles in pdf format.